The U.S. Environmental Protection Agency’s latest draft Greenhouse Gas Inventory shows methane emissions from natural gas production have fallen substantially, a decline that supports recent research finding low leakage rates in major shale basins. Since 2007, methane emissions from natural gas production activities have dropped by 35 percent, according to the EPA. Over the same period, U.S. natural gas production has increased by 22 percent. Each year, the EPA incorporates new data and methodologies to improve the accuracy of its Greenhouse Gas Inventory. The EPA similarly observed methane emissions declines from natural gas systems last year and in its 2013 report. Activities associated with livestock overtook natural gas systems last year as the largest source of methane emissions in the United States, a scenario that remains unchanged in the latest draft Inventory. The EPA’s findings come in the wake of new research showing methane emissions in major shale basins are far lower than previously thought. 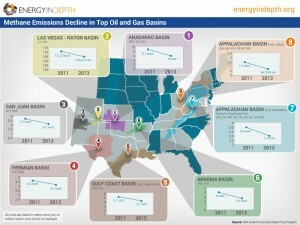 A report published by Energy In Depth late last year showed declines in methane emissions associated with oil and natural gas production in some of the most significant producing basins nationwide, even as production has increased substantially. In recent years, methane emissions have declined in major oil and natural gas basins, even as production has skyrocketed. The EPA is currently considering the imposition of new methane rules on America’s energy producers, despite the fact that the industry is already reducing those emissions. U.S. oil production has skyrocketed in recent years, increasing by 39 percent between 2009 and 2013. That rate of growth is more than double the increase in methane emissions (18 percent) from petroleum production activities over the same period, underscoring the industry’s active and ongoing investments to prevent leaks and reduce emissions. Last fall, the EPA reported that methane emissions associated with hydraulic fracturing (“fracking”) have declined by 73 percent since 2011.